Yom Kippur 3881, (120 C.E.) Jerusalem lay in ruins. The city was destroyed, and Jews were exiled from its environs. Spirits, however, were not broken. The will to throw off the cruel Roman yoke lived on, even though the Romans were treacherous with anyone who showed the smallest inclination to rebel. On that Yom Kippur day one of the greatest sages in Jewish history was taken by his Roman captors and put to a torturous death. He had been imprisoned for siding with those opposed to Roman rule. Now he was to be killed. His skin was scraped from his body with iron combs. Yet, not even the harsh Romans could sway him from his faith. As tradition relates, the words of Shema Yisroel were on Rabbi Akiva's lips as he expired. 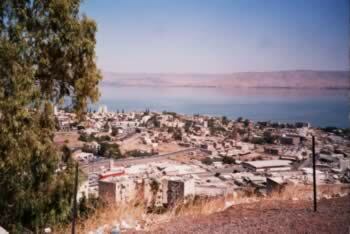 The grave of Rabbi Akiva is on a hill in Tiberias overlooking the Kinneret. 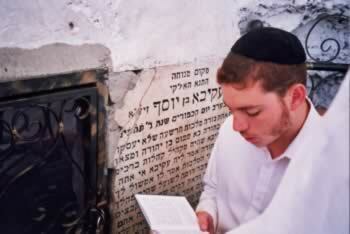 There are many Jewish laws concerning what prayer is permissible to utter at a grave. It is forbidden, for example, to pray to the deceased. There is, though, one prayer upon which all agree. We can look back at the life of Rabbi Akiva as a model and inspiration for our own lives. In these days before Yom Kippur we all examine our souls. With the readers' permission, let me step back from my usual reserved third-person style and offer a few words of introspection. I have always felt that the occasional Annals of a Traveler printed in the Jewish Magazine should be more than a routine travelogue of history, restaurants, and hotels. I have tried to highlight places that deepen our Jewish understanding and strengthen our emunah. Personally, the research for several articles about Yerushalayim gave me much better insight into the city at the time of the Churbon. As we contemplate the life of Rabbi Akiva, whether it be at gravesite with Tehillim in hand or from afar, we must remember a man whose contribution to Judaism is immeasurable. He is history's most celebrated "baal teshuva" (repenent), rising from negative feelings to be the teacher of 24,000 students, a position to which he responded with total humility. The frequent mention of his name in the Gemara is testimony to the positive influence that he exerted on our entire way of life. It is more than pro forma that we mention his wife, Rachel, who is also buried in the area of Tiberias. There are numerous trite sayings placing a woman at her husband's side. The example of Rachel goes well beyond that. It was she would made and encouraged her husband. We can well think of Rabbi Akiva and his wife, when we wish that someone build a "bait ne'eman b'yisroel." There are many stories about Rabbi Akiva. I should like to close with one in particular. The Talmud relates the astonishment when people saw the joy of Rabbi Akiva as he gazed upon a fox running amongst the stones of the destruction on the Temple Mount. Why was he so happy? As he responded, just as this part of the prophesy was fulfilled, so with the rest happen --- the Holy Temple will be rebuilt and speedily in our time! From the Central Bus Station in Tiberias it is easiest to take a taxi to the grave of Rabbi Akiva. Cohanim can view the grave from behind the fence that encircles the area. There are prayer books on site for those who do not bring their own.